Often there is talk of the FED and the “Rothschild central banks”. The Rothschilds were prominent as bankers for a fact in the 19th century in Europe. However, when the Deutsche Bank (German Bank) was founded by Siemens the German capital took the lead. In the US, the Rothshilds have never got a foot in the door. The United States has changed in the 100 years from 1850 to 1950 from the “Wild West” into the leading industrial nation. This did not happen by itself, it was carried out by strong-willed capitalists who accumulated wealth that surpassed anything previously known by a factor of a thousand. Vanderbilt had built as hard businessman a fleet of steamships, which dominated the “Wild West”. When the railroads came up, he sold all the steamers and become the undisputed railway monopolist. With the railroads yielded the bridge problem. Carnegie solved it with steel structures and thus became the steel magnate and monopolists who’s steel and construction industry made the construction of skyscrapers possible. His monopoly was bought out for 400 million by JP Morgan. Carngie was for a short time the richest man who ever lived. Rockefeller – nicknamed The Anaconda – was only oil producer and then invested in refineries. He became famous for his “Standard Oil”. Petroleum has been offered in the market in various qualities and could explode, resulting in deaths and house fires. Rockefeller guaranteed with “Standard Oil” a consistent quality – a standard – with which he conquered the market overnight – and then gave away the oil lamps for free, which enlarged its customer base quickly. Rockefeller founded a consortium (under his leadership) with other oil producers and successfully gave to the railway company the impression that he would represent the entire oil industry. He was able to negotiate an extremely low price of transport as a result. Through this low price the other refineries could not compete with the new low petroleum price and Rockefeller bought them off trough straw men. Having control over the refineries Rockefeller increased the prices for producers, which drove them out of business and enabled him to buy them for cents on the dollar. Also the downstream, the gas stations were controlled by him. From Standard Oil´s capital letters – S.O. – “Esso” spoken, the still existing gas station´s chain name originated. At the end Rockefeller was in control of over 99.9% of the US oil market and 70% of the international oil market. The Russian social democrat and revolutionary Vladmir Illitsch Ulyanov took Rockefeller as an example of his treatise “Imperialism, the Highest Stage of Capitalism”, which described that capitalist becoming monopolists and so rich and powerful that they can finance the candidacies of politicians and in consequence even decide to have wars being fought on their behalf. (Imperialism = generalship). When Rockefeller died in 1937, he was 1.4 billion worth – in today’s purchasing power 22 billion US dollars. 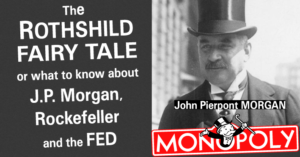 J.P. Morgan initiated the FED, after he had previously saved the United States on several occasions over millions loans defaults and circumvented state crash´s. At this point, one can mention Paul Warburg. Paul Warburg came from a German-Jewish family and married a daughter of Solomon Loeb, who in turn was a co-founder of the New York banking house Kuhn, Loeb and Co.. These bankers were “Gentleman Banker´s”, who wanted nothing to do with the Wall Street and invested in Westinghouse Electric had financed the Tesla company, which was targeted and ruined by JP Morgan. Antisemits try to connect Warburg to the Rothschilds. There is in principle a connection because the is brother, was apprenticed at the Rothschilds in Berlin and Paris. He might have possibly even seen a couple of times a Rothshild from a distance during his apprenticeship. The Warburg were rich but the Rothschilds were at that time already quasi European uber-aristocracy. Adding to the Rothschild a list of in-laws relationship of Warburg´s Bankhaus Kühn, Loeb and Kuhn and it looks as if the FED a Jewish establishment. Bit when looking to the proportions, JP Morgan was a trillionaire, the Warburg were millionaires. Morgan and Rockefeller – the “Illuminati” – conspiracy. The best democracy money can buy. J.P. Morgan (see the man on the “Monopoly” game) and John D. Rockefeller funded also the first “purchased” president – McKinley – to prevent the dismantling of monopolies. Theodore Roosevelt had the dismantling of monopolies on his agenda. To prevent it competitors Rockefeller and Morgan teamed up and financed McKinley, who was assassinated by an anarchist, so that monopoly-capitalism critic Roosevelt became president. 1905, the Standard Oil empire Rockefeller was smashed. It did not stop Rockefeller to become richer though, as petrol for cars came into demand. Once only Rockefeller Standard Oil (now Exxon-Mobil) kerosene lamps “illuminated” – the US, then JP Morgan´s General Electric “illuminated” every house with electricity and the light bulb. These are the real figures which inspired “Illuminati Conspiracy” – a deliberate disinformation by the right-wing John Birch Society, with the aim of discrediting socialist ideas. The world is capitalized and if there is a new branch of economy, it will through massive capital investment quickly become overly productive and also go into a crisis. Individual workstations with the latest technology equipped produce products – although with less and less work, but it takes longer and longer to amortize investments. Since there are fewer opportunities to make real profits – investors gamble – certainly with the support of lowest interest money that is printed by the Fed. The problem is not the money economy, it is a symptom of the lack of real profitable investment opportunities. This is capitalism having conquered the world and eating itself leaving the people in agony.